When I started Gutterball Special almost a year ago, I hoped to write a feature called Tea & Comics, which would have Dani and I discuss the new comics which came out every week. We managed to keep this going for a little while, but the posts were almost always late, as the process of transcribing our conversations was time-consuming and cumbersome. Despite this, I loved doing that column, but our respective schedules grew prohibitive, and regrettably, Tea & Comics just dwindled out entirely. Our schedules have not grown any less prohibitive, but I am nevertheless happy to announce the return of Tea & Comics, albeit in a completely different form. Instead of being a conversation between Dani and myself, it will instead be a much more conventional blog post, written solely by me, and will focus instead on a comic or something comics-related which makes me happy that week. The purpose is twofold: it lets Gutterball Special address current comics and happenings on a weekly basis, but more importantly, it adds a little extra positivity into comics coverage. That latter point has recently started to crystallize as one of the guiding principles behind writing Gutterball Special, its raison d’être, if you will. Comics mean a lot to me, and I would characterize their influence in my life as an unquestionably positive one. At various points in my life, I have found inspiration in comics. Comics have lifted me when I’m low. In very tangible ways, comics have changed my life. Thus, I understand completely when fans take a very serious, personal affront to things that occur within the pages of a comic book. The passion of comics fandom is incredible, but in recent weeks, across Twitter and the comments sections of just about any comics-related website, the differing passions of different comic fans and creators are mixing like fire and gasoline. Whether regarding the apparent reveal of Captain America as a Hydra sleeper agent or Frank Cho’s disgruntled resignation from drawing variant covers for Wonder Woman, these explosive shouting matches within comics fandom usually contain genuine concerns and thoughtful points at their core but are quickly corrupted by straw-man arguments and needlessly incendiary language. As much as I might just want to read my comics quietly in my own corner and be happy about it, I would never deny that the comics industry offers a whole lot to get angry about. People aren’t wrong to get angry about the lack of visible LGBTQ+ and people of colour in the industry (and in the books themselves), or the chronic sexism apparent in the representation of women in comics, overshadowed only by the blind eye turned toward the consistent issue of harassment faced by women within the industry. Really, it would be wrong to not be angry about these and the myriad other problems within comics right now. But, in the midst of all these righteous battles being fought, it does get easy to forget that comics aren’t just unending sources of grief. Despite the enormous value in calling out various issues, other (better) writers with more valuable and diverse perspectives than myself are doing an incredible job of doing precisely that – I have very little to add to these conversations other than to emphatically nod. Which, rather than turning this blog into a list of links to articles from The Mary Sue, Women Write About Comics, and Panels, I thought I would contribute something different to the ongoing conversation about comics, something which I find to be sorely lacking: positivity. Tea & Comics is named for a routine that Dani and I enjoyed in the early days of our relationship: On Wednesdays, we would walk from her university residence to Paradise Comics to buy the new issues of any series we were following, and maybe an issue or two of whatever Doug told us was good. Then, we would take our comics two doors down to DAVIDsTEA, where we would each order a tea and read our new comics. Outside of the perfect snapshot which that routine provides, everything else might’ve been a mess – we were near broke, and both of us at different points were buckling under an enormous amount of school work and scrambling to beat deadlines. But that isn’t what I remember when I think about that time in our lives: I think of the simple, beautiful, near-magical pleasure of enjoying one another’s company and sharing tea and comics. Tea & Comics: All I Have To Do Is Dream . . .
“Tea & Comics” is a weekly feature here at Gutterball Special, in which my girlfriend Dani and I talk about the week’s new comics over a cup of tea. A: This is a slightly unusual Tea & Comics – very few comics on our pull list came out this week. Only two, actually: Archie #3 and Sandman: Overture #6. D: But Jughead #1 comes out next week, so we’ll discuss Archie #3 at the same time. Which means we’re only going to talk about Sandman this week. A: Which is well worth our while, because this is really an astounding series. And we will be discussing the series as a whole – the six issues of this book were released over the course of two years, so even though I’ve been reading each issue as it comes out, we both read the entire series from beginning to end this week. D: This is by Neil Gaiman, who, even if you don’t read comics, you might know from Coraline, Stardust, American Gods . . . his breadth of literary works is astounding. The ideas which he explores in Sandman are ones that he’s delved pretty deeply into in some of his other works as well, such as dreams and storytelling, and even the personification of concepts. A: He never shies away from tackling more abstract ideas, and personifying them in unique ways. It’s maybe slightly easier notion to grasp in something like American Gods, where those characters are very concretely deities, who are given power from people’s belief in them, whereas in Sandman, we have similar personification of ideas, but these are not gods; the Sandman is not the God of Dreams, he’s the very concept of dreams. “Tea & Comics” is (usually) a weekly feature here at Gutterball Special, in which my girlfriend Dani and I talk about the week’s new comics over a cup of tea. This week, we discuss two week’s worth of comics: Invader Zim #3, Rat Queens #12, Bizarro #4, Southern Cross #5, Black Canary #4, Fight Club 2 #5, Teenage Mutant Ninja Turtles: Casey & April #4, Batgirl #44, Grayson #12, We Are Robin #4, and 1872 #3. A: Welcome to our first ever double-sized instalment of Tea & Comics. Today, we discuss two weeks worth of comics. D: While not drinking tea. A: Nope. Sorry. We’ll get there. Now, we have a lot to cover, so without further ado, let’s get started. First up: Invader Zim. This is issue three and it was absolutely delightful. 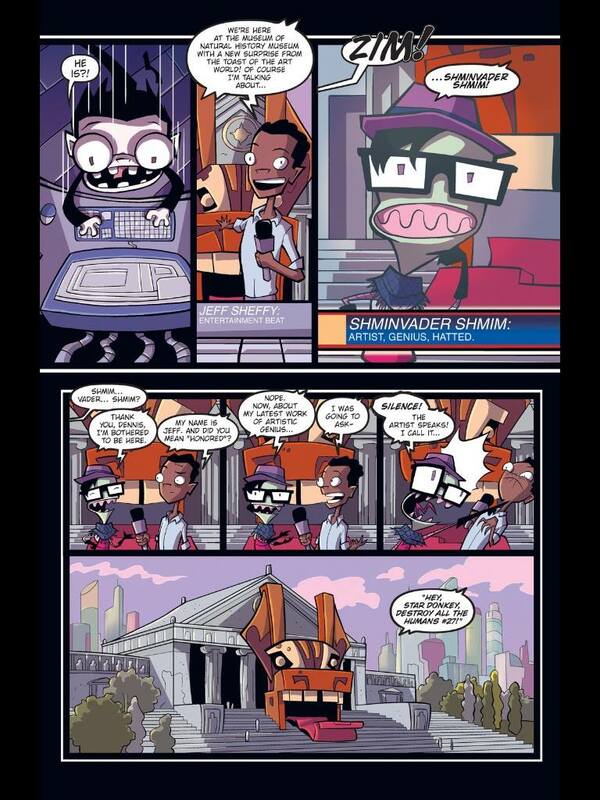 D: This is the best issue of Invader Zim yet. For the first time, the comic really goes beyond what the cartoon could do thematically, and really brings a new dimension to it. A: I remember in advance of the series coming out, reading an interview with Jhonen Vasquez about the series, in which he mentioned that, because the comic isn’t owned or licensed by Nickelodeon, he has a lot of freedom to do things in his comic that he wouldn’t be allowed in the cartoon. I think we start to see that here; not that it’s a racy story, or for mature audiences at all. It’s still very much in the same vein as the cartoon, but it veers toward the more satirical. D: I think it knows it’s audience, who are probably mostly people who watched the cartoon, who are a little older now, even though the characters remain the same age as in the cartoon. This issue pokes fun at hipsters, and the pretentiousness of high art appreciation, and it’s so much fun to read. Art by Aaron Alexovich, from Invader Zim #3. This week, we discuss Gotham Academy #10, Batman #44, Catwoman #44, Starve #4, and Phonogram: The Immaterial Girl #2. A: This is kind of an interesting Tea & Comics: These are new issues of the same titles we featured in our first one. Which means we have been doing this for a month. D: And we both drank tea today. It only took us a month to get the “tea” part right. A: Well, almost right. I’m not currently drinking tea, but yes, I did drink tea today. We’re getting there. Now, same as a month ago we are discussing Gotham Academy, Batman, Catwoman, Starve and Phonogram: The Immaterial Girl. 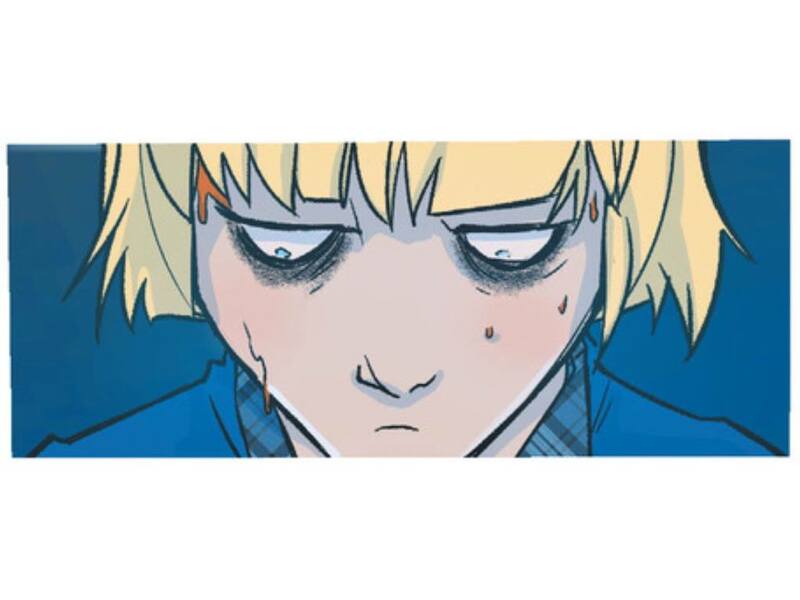 A: Without further ado: Gotham Academy. It’s the same team as usual: Becky Cloonan and Brenden Fletcher writing, Karl Kerschl on art, though he gets an assist from Msassyk on this issue, who is also doing colours on this issue with Serge LaPointe. This is another wonderful issue in a wonderful series, and I don’t have a whole lot to add beyond that, to be honest. It’s pretty much a done-in-one issue, though we do get to see the plot of Olive and her mother continue to move forward as well. We have leveled the criticism toward a few titles that their stories seem designed to read in trade and that reading them issue-by-issue isn’t ideal, but Gotham Academy is serialized storytelling done right; it’s perfectly structured for single issues. D: Those same episodic qualities give the story in each issue more room to delve a little deeper into the secondary characters and what’s going on behind-the-scenes. The main storyline, which is definitely the Olive-Calamity plot, is there, but this issue is much more about Katherine. This week, we discuss We Stand On Guard #3, Plutona #1, Midnighter #4, and The Omega Men #4. A: Neither of us are drinking tea this time . . .
D: But at least we’re not eating pizza! I mean, we just did eat pizza, but we aren’t currently eating it while we’re doing this, unlike the past two or three Tea & Comics. A: Pizza & Comics just doesn’t sound as . . . cultured. D: This is a much lighter week – we’ve only got four comics. Actually, only three are on the pull list, but you added a fourth one last minute. A: It’s true. Plutona was not on the pull list. D: But that’s not the first one we’re going to talk about. This is We Stand On Guard, and it’s one that we have mixed feelings about.